Send us your broken device and we will repair it for you. We have an extensive collection of in house hardware and expertise. Ideal for repairing devices. We have many years experience and our on site engineers can repair just about any Phone on the market. How can I trust Phone Hut UK with my Phone. We pride ourselves on our work, and have been fixing customers Phones since 2005. Because we also supply the latest repair equipment worldwide you can rest easily knowing that we know what we are doing. We are trustworthy, Apple Certified, established VAT registered company, both online and on the high street. What if my device cannot be repaired? We have very good in-house engineers who have a very high success rate of repairing devices. If this is the case and we cannot repair the device, we will return your device to you and refund any payment made to us. If the device can be repaired but needs more parts to do the job, our engineers will call you first to explain this before any work is carried out. We repair your device within 3 days after it arrives to us and in many cases we will repair it the same day it arrives and post it back to you the same day too! You can pay online or you can send postal order, cheques (you have to wait for cheque to clear) or Cash. 1.) 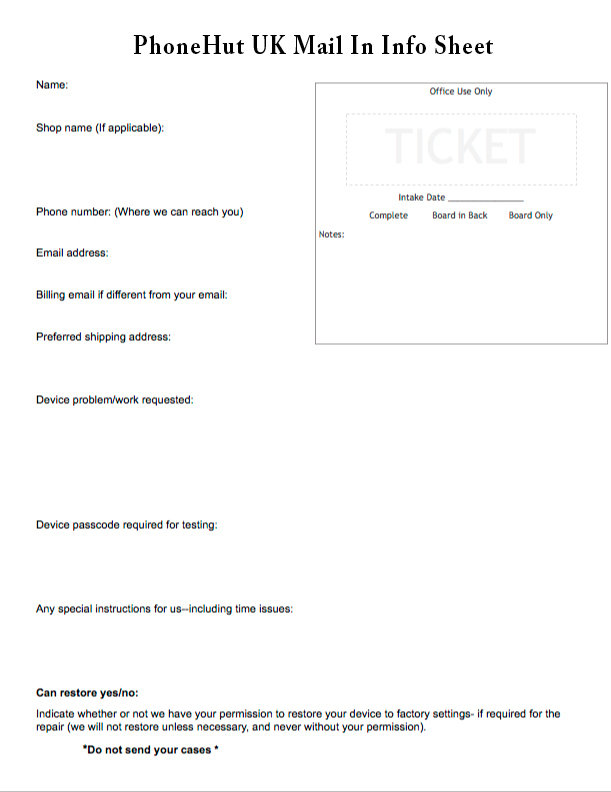 Use this Printable Info Sheet fill this out and include it with your device. The paper sheet will help us match your device to your work request on arrival. 2.) Take out your simcard card and keep it safe, as this is not needed. 3.) If possible, fully charge the battery and turn your device off. 4.) Wrap your device in bubble wrap or similar. 5. )Send your device to us at the address below via special delivery, to ensure your device is delivered to us safely.